If you have a Zinsco breaker box, we highly recommend that you have it replaced immediately! The Zinsco circuit breakers have problems with improper heat dissipation that can lead to burning of the circuit breaker itself. The Zinsco breaker boxes use an unanodized or unplated aluminum bus bar arrangement. In moist/humid climates like Florida this can lead to excessive oxidation and cause the bus bars to reduce in size. 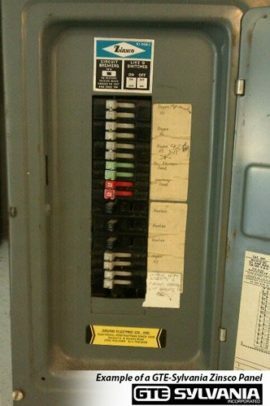 This process can lead to loose connections and result in arcing or burning at the circuit breaker connection point and potentially cause a fire. Contact A.S. Electric, Inc. to replace this hazardous equipment and avoid a potential costly and even life threatening fire damage to your home or business.